2 monsters with different Types and different Attributes This card’s name becomes “Aleister the Invoker” while on the field or in the GY. If a monster is Fusion Summoned while you control this monster (except during the Damage Step): You can discard 1 card, and if you do, add 1 “Invocation” or “The Book of the Law” from your Deck to your hand. If this face-up card you control leaves the field because of an opponent’s card effect: You can add 1 “Omega Summon” from your Deck to your hand. Happy Monday! 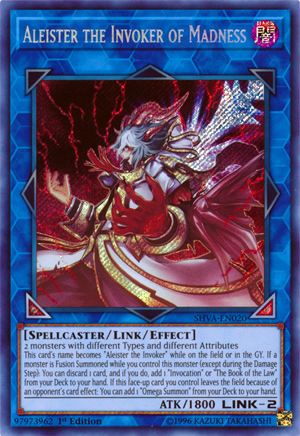 Aleister the Invoker of Madness is a Link 2 Dark Spellcaster-type Link Monster with 1800 Atk and Bottom Left and Bottom Right Arrows. He requires 2 monsters with different types and Attributes, but that isn’t difficult in whatever deck you put the Invoked Engine into. But is this really necessary? No. Some of the cards this searches aren’t really played. While on the field or in the grave Mad Al becomes regular Al, which makes sense and can continue Invoked plays. If anything is Fusion Summoned while you control Mad Al, you can search Invokation (yes) or a Book of Law (probably not) from your deck to your hand. This is not once per turn and you can do it if your opponent Fusion Summons as well, but each time will cost a Discard from your hand. As a bonus free floating effect, if Mad Al leaves the field because of an opponent’s effect, you can search Omega Summon from the deck to the hand. Searching effects are nice, but you might not be playing it. Maybe now you will, but Mad Al is good support for a well supported engine, so it will score well. This week seems to be some cards from recent product releases, excluding Throwback Thursday of course, and today we are looking at the chase card in Shadows in Valhalla, Aleister the Invoker of Madness. AtIoM is a Link-2 DARK Spellcaster with 1800 ATK, arrows pointing Bottom Left and Bottom Right, and requires 2 monsters with different Types and Attributes. The summoning condition is easier to fulfil than you might imagine, Spacegoat gives you Tokens which one can give you the DARK Cyberse Linkuriboh and still have three EARTH Beast Tokens, Arrows are the best possible for any Link-2 monster, DARK and Spellcaster are good, and 1800 ATK is acceptable on a Link-2 that doesn’t require big monsters. While on the field or in the GY, this card is treated as Aleister the Invoker so you have an extra target to fuse with Invocation. If a monster is Fusion Summoned while you control this monster (except during the Damage Step), you can discard 1 card to add 1 Invocation or 1 The Book of the Law from your deck to your hand. Invocation will continue your Invoked plays while The Book of the Law can tag out an Invoked Fusion for another one. Nice to have another searcher for Invocation and a searcher for The Book of the Law. If this face-up card leaves the field because of an opponent’s card effect, you can add 1 Omega Summon from your deck to your hand. Omega Summon will just let you get back all of your banished Invoked monsters in Defense Position, which you don’t banish them often, plus your opponent will likely and easily be able to kill this in battle, so Omega Summon still isn’t worth searching for. The first part of the effect is still really good and I guess the second part is nice to have just in case something changes in the future, plus the materials give you a decent ATK in decks that use different Types and Attributes, though you probably won’t make good on the effect too much. This Link Monster is great with the Invoked engine and is worth dedicating a slot in the Extra Deck to in Invoked variants. Art: 4.25/5 I guess Aleister’s research as Crowley, the Origin of Prophecy didn’t go too well. Aleister the Invoker of Madness is a very good card. Dark, Spellcaster, Link 2, with 1800 attack who requires two Monsters of different Types and Attributes for a Link Summon. While on the Field or in the Graveyard, this card becomes Aleister the Invoker, which is good for the Deck. So first off, if a Monster is Fusion Summoned while you control this card (save the Damage Step) you can discard one card to add an Invocation or The Book of Law to your Hand from your Deck. Invocation is a huge Fusion tool for this Deck, so getting it quicker (likely by your own Fusion Summon) is a huge benefit. The Book of Law grants you a theme specific Special Summon, but doesn’t work for Fusion as the prior, so getting these quicker is great. If a card effect from your opponent causes this card to leave the Field, (while face-up) you can add an Omega Summon from your Deck to your Hand. That card lets you bring your removed Invoker Monsters back to the Field in defense position. This card is GREAT…replaces itself, gives you many options, helps spam and add speed to a powerful Deck.